The Mare Island Causeway Bridge is located at the north end of the Vallejo Waterfront. 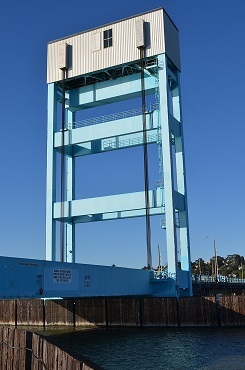 This bridge connects Mare Island to the Greater Vallejo area and is accessible to vehicles, pedestrian, and rail traffic. The City of Vallejo is responsible for the maintenance and operation of the Mare Island Vertical Lift Span Bridge. Please check back for preventative maintenance work schedule in late 2017. Regular Hours: 9:00 a.m. – 7:00 p.m., 7 days a week. After Hours Lift Requests: 7:00 p.m. – 9:00 a.m.
To request bridge opening during these hours, please call (707) 562-3556. Two (2) hours advance notice is required for assistance after hours. Please call (707)562-3556 and follow the prompts provided. Requests must be submitted two (2) hours in advance of needed bridge opening. For questions unrelated to Lift Requests, please call the Traffic Maintenance section at (707)648-4518.